You have probably heard of the Morse SOS messages. This code was one of the fundamentals of early telecommunication. You’re bound to find it interesting, and chances are, you’re curious enough to know how to send secret messages to your friends, or decode mysterious codes featured in war documentaries. Although the code was initially for telegraph lines, you can now use it if you’re fascinated by the radio or if you want to send an emergency distress signal. Thus, you must know about the best Free Morse Code Translator out there. Whatever the reason, this code is easy for software to convert to text using morse code converter or english to morse code and you are about to discover six tools that can do the job. You must remember that most of these options require you to type your code as dots and dashes and they cannot accept audio input. It’s easier to note the dots and dashes of the sound you’re listening to and manually type the code. You can also have a look on code generators. Here is the list of the top 6 Morse Code Translators that we have tested and compiled for you. The SCPhillips site has a free webspace to let you convert text to code, or code to text. To convert text to code, you just have to type your input, and you’ll acquire your code regarding dots, dashes, and characters. What’s better, is that this morse code decoder allows you to save the output code as an audio file. It also lets you set pitch and speed for your output code, and lets you share the final code with a friend. 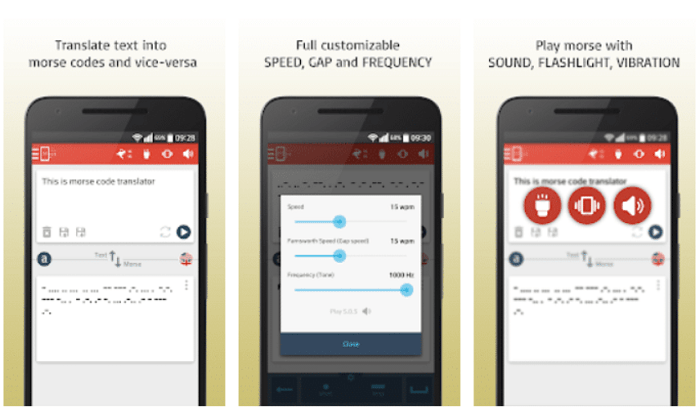 This morse translator has secured a 4.7 rating on Google play store and for a good reason. The app lets you convert text to code or code to text very quickly. You’ll have to personally type the code as dashes and dots. You’ll also find this Free Morse Code Translator easy to use. Unfortunately, you might have to deal with some ads on this application. Besides that, this translator is one of the simplest. With a 4.1 rating on the Google play store, this app meets many needs, and you get to enjoy a flashlight feature to transmit code. The app gives great audio feedback, which you can edit, and lets you share your code. However, you’ll probably have a problem with the fact that the tapping gaps for dots and dashes are sometimes the same. PixelCan has fixed many bugs that were reported in the past, so the app assures you of simplicity in use and effectiveness of translation. Click here to goto Morse Code Translator App by PixelCan. 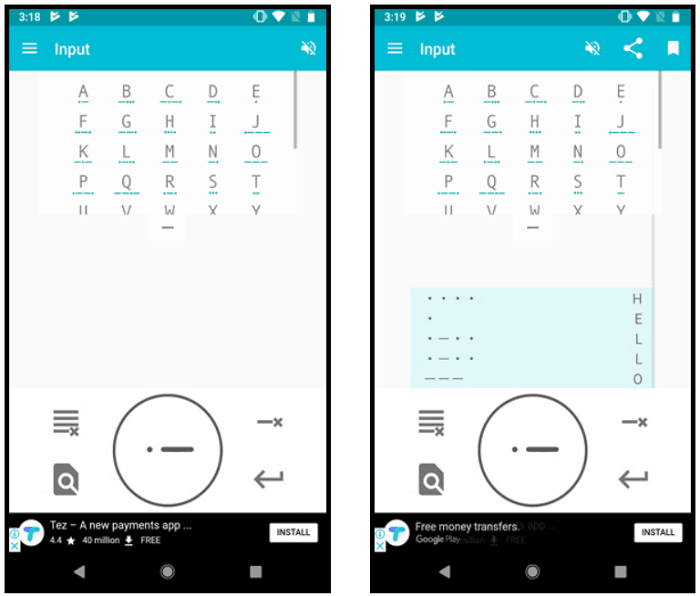 Apps Bilgi has created a very simple Free Morse Code Translator that converts text to Morse code or morse code to english. You will have to deal with the fact that the app doesn’t have a flashlight transmission of code feature. However, the app makes up for it in many ways. It gives you an audio file as well as a Morse code when you type in text. You can configure the speed, gap, and frequency of the audio code. It has a strong repeatable playing feature. You’ll also be delighted to know that this app has a finger tap keyboard, where a long tap is considered to be a dash, and a short tap is taken to be a dot. This makes typing the code in the input box, much faster and simpler. Hence it is a easy interface morse code generator too. This app enjoys a 4.3 rating on Google play store. 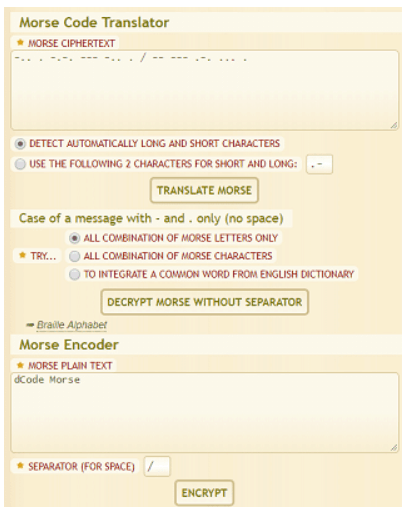 This Free Morse Code Translator website is one of the first code decryption sites to come out. You’ll have to keep in mind that it’s old, because it explains the limited functions that you can perform in it’s code to text Converter. Another pitfall is that it produces no audio feedback. You’ll still find it to be a redeemable translator that does its job without a hitch, and you’ll be able to appreciate the fact that it’s a website and not an app, that saves you space, bug problems and data. Another Free Morse Code Translator website that saves you from the task of downloading an app, Dcode has some great features that make it a reliable tool for code conversion. This website lets you define a range of characters. You can even use two characters of your choice for short code character and long code character. The website also lets you type Morse letters, Morse characters and lets you involve a word from the dictionary. 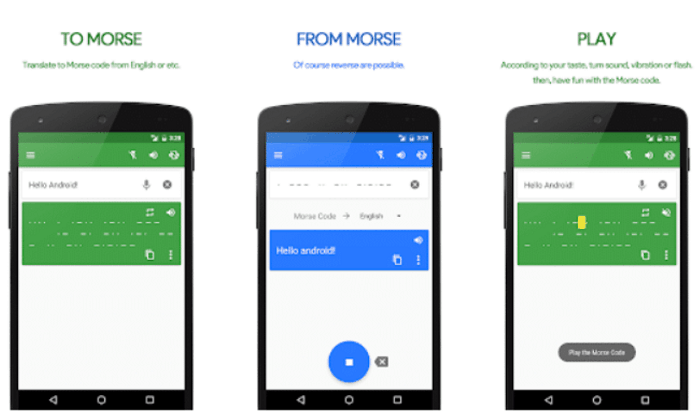 In other words, it lets you translate morse code. The Dcode webpage lets you translate without a separator. These six options are the best and easy to use Free Morse Code Translator right now. You’ll discover that it’s much safer to use a free tool to decrypt code. Rather than to invest in a paid product. The Morse code is a free and easily accessible code. And you should not be carried away by fancy and costly software that often don’t carry additional unique features. So convert text to code or the other way around. Have flashlight transmission games with children or send your friends secret passages- using free code converters. 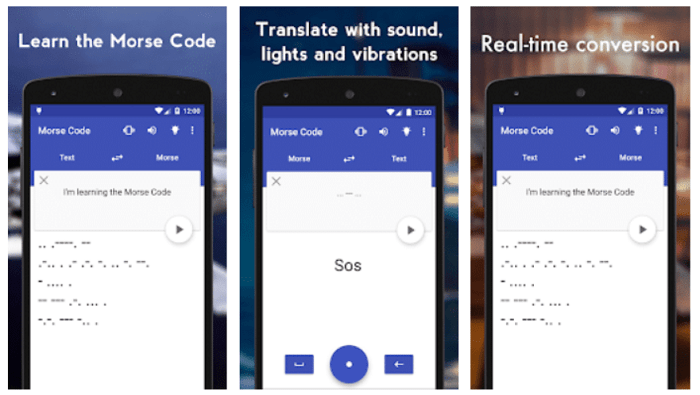 Morse is basically a morse code learning and practising app that helps you with morse codes in 3 different languages. 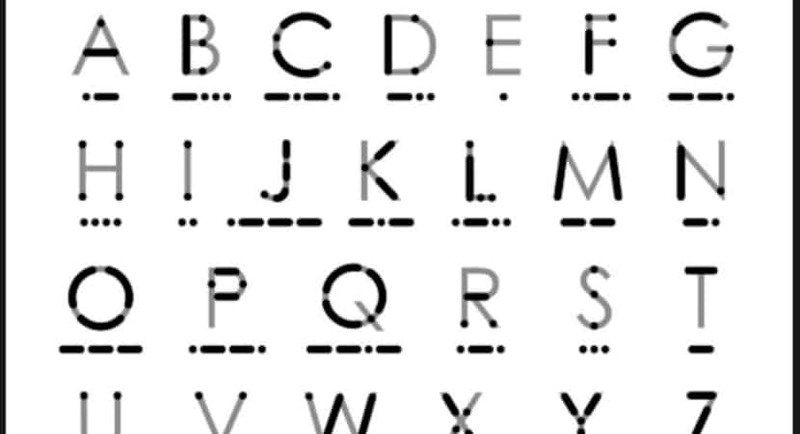 It has a very simple interface which displays the morse code when you click on the alphabet. The app also lets you share messages with your friends. You can short press the button for a (.) and long press it for a (-). You can simply convert a whole message into morse code by typing the message all at once and then using the convert option. Now you can easily learn morse codes with these amazing morse code generators and get a grip over this ancient yet amazing language. Do have a look at all the tools that we have compiled for you.